The year 1999 proved to be a troubled one for China. The Balkan Peninsula had always been regarded as a “powder keg,” and it was in 1999 that a fateful spark was finally ignited. The Serbian army that year slaughtered thousands of Albanian civilians in a wave of ethnic cleansing, forcing more than 1.5 million Albanians to flee their homeland. As described by the refugees, massacres took place in at least 75 cities and villages in Kosovo. More than 5,000 ethnic Albanians were eliminated in mass executions. While the international community was outraged over Slobodan Milosevic’s genocidal crimes, the people of China had little idea of what had happened. China’s state-controlled media only allowed, as usual, one voice—that of the Party—and that voice told not the plight of the Albanians. The United Nations didn’t intervene militarily in the matter owing to protest by China and Russia. In the end it was NATO—led by the United States—that, out of humanitarian considerations, launched an air raid on Yugoslavia. The move took place on March 24, 1999. The 2nd Session of the 9th National People’s Congress (NPC) had concluded two weeks before the air raid. In a NPC press conference, Premier Zhu Rongji said of his upcoming visit to the U.S., “Since you [the U.S.] are angry, I wish to visit so as to dispel the anger you feel.” However, with NATO air raids having begun, if Zhu Rongji went to the U.S. and made significant concessions on the matter of the WTO (to which China then sought admittance), it would be hard to pacify the nationalistic sentiment that had been stirred up among the general populace of China; people wouldn’t settle for a compromise. Were he not to go, though, a golden opportunity might be missed. The Politburo held a meeting to discuss expressly this issue. Both Li Peng and Qian Qichen were against Zhu Rongji’s visit to the U.S. They thought his “appeasement diplomacy” amounted to begging for favors and showing weakness. However, Jiang Zemin urged Zhu to leave for the U.S. as scheduled. If the negotiations with the U.S. on WTO accession were to succeed, Jiang—as the General Secretary of the CCP—would naturally get credit. 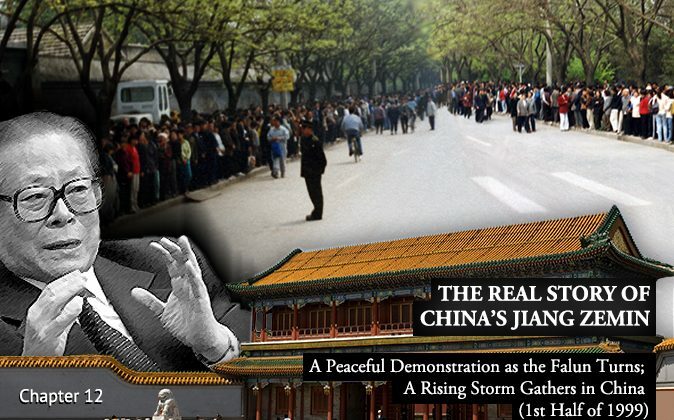 It would be an achievement during the Jiang Zemin era written into history. Were the negotiations to fail, it would stand to deflate Zhu’s arrogance—a prospect Jiang welcomed, as Zhu’s substantial contributions at the time jeopardized Jiang’s standing. Some of Jiang’s conversations with aids and staff indicated that he would rather Zhu return having failed. If it weren’t for the fact that Jiang needed Zhu to clean up the mess that was then China’s economy, Jiang would never have utilized Zhu. Jiang had been envious of Zhu’s charisma since as early as the pair’s Shanghai days. When Zhu met with the press or spoke at meetings, he would say something sincere, which others found stirring. Zhu’s words were not only more honest than Jiang’s, but more upright and caring. He was even liked by the attractive female reporters from Hong Kong and Taiwan. Zhu’s “appeasement diplomacy” suffered great setbacks. Since the United States didn’t consider China a market economy, it proposed many additional terms. It was largely impossible for China to sign the WTO agreement before Zhu returned to China. Although every concession Zhu made was approved by Jiang, the CCP’s senior statesmen were unhappy with Zhu’s concessions. Qiao Shi, who seldom spoke out about anything, was outraged upon learning of the role Jiang had played, and said, “National interests are first and foremost. They should never be forgotten at any time or in any circumstance.” Party veterans such as Wan Li and Song Ping even called the agreements a “new Twenty-One Demands.”  Upon seeing their reactions, Jiang played a trick and replied to the criticism with a Chinese proverb, “When a general is away, even the emperor’s orders may sometimes not be obeyed.”  Jiang seamlessly shifted all the blame to Zhu Rongji. Zhu returned to China from his U.S. visit on April 21. So as to avoid seeing Zhu, Jiang went to Hubei with staff of the General Office of the CCP’s Central Committee to attend a meeting. He also instructed Li Lanqing to leave for Liaoning. When Zhu returned he received a rather cold and cheerless welcome. In a Politburo meeting that followed, Jiang turned toward Zhu and disdainfully questioned him, “In the negotiation why did you go beyond the bottom line set before by the Politburo?” In Zhu’s presence he praised Wu Yi, who had traveled to the U.S. with Zhu, saying, “Comrade Wu Yi was courageous to hold her ground and refuse to compromise her principles while making deals.” The remarks greatly embarrassed Zhu. Jiang was filled with a sense of exaltation upon seeing Zhu’s eminence dashed to such a degree. There appears to be a pattern whereby the CCP goes through something tumultuous in each year that ends with the number “9.” In 1949 the CCP fought the remainder of a civil war and established its regime. In 1959 it suppressed the Tibetan “rebellion” (as it was misleadingly called) and started a war with India. In 1969 it fought a battle with the Soviet Union. In 1979 there was the Sino-Vietnamese War. In 1989 the CCP first suppressed a so-called Tibetan “riot” and then, on June 4, there was the Tiananmen Square Massacre of student activists. In 1999 the CCP launched its suppression of Falun Gong. The matter of Falun Gong calls for a certain amount of explanation. Outsiders typically have two misconceptions about the practice. First, many think that when Jiang Zemin initiated the suppression of Falun Gong he, as with other top CCP officials, knew little about the group. This is not accurate in the least, however. Secondly, many think that the suppression started in 1999 and that prior to that the CCP had been at peace with Falun Gong. This was not exactly the case, either, however. The fact is, China’s top Party officials learned about Falun Gong very early on and were quite clear about what the practice is. It was merely that some persons sought to stir up problems with the group, with the result that a number of complications came about. The founder of Falun Gong, a Mr. Li Hongzhi, started to teach the practice publicly in May 1992. Soon after, there was a sizeable practice site in Beijing’s Purple Bamboo Park. Many retired senior cadres of the CCP live in the vicinity of the park, among whom were, at the time, retired military generals and high-ranking officials from the State Council as well as various departments in the Party Central Committee. These people’s length of service and experience in the Party far surpassed those of Jiang Zemin, Zhu Rongji, Luo Gan, and Li Lanqing, and as such they belonged to the true “older generation of proletariat revolutionaries”—as the CCP called it. Some had even participated in the famed Long March of 1934. The members of the Standing Committee of the CCP’s 15th National Congress (in 1997) were all formerly subordinates of these figures and thus their “juniors.” One officer with the surname of Zhou, for example, had retired from the powerful State Council and had been Zhu Rongji’s superior. He would call Zhu “Young Zhu” whenever the two met. These retired officers had time aplenty on their hands, and many had practiced qigong. They also talked to one another and shared news regularly. Upon taking up Falun Gong many of them introduced it to their former subordinates, who had since come to hold positions of power. Sometime before 1996 a Falun Gong practitioner in the Purple Bamboo Park area went to Jiang Zemin’s home to teach Jiang’s wife, Wang Yeping, the exercises. Li Lanqing similarly knew Falun Gong from an early date. Li used to be Minister of Foreign Trade and Economic Cooperation, and was the immediate superior of a Falun Gong adherent with whom he enjoyed a good relationship. Sources reveal that in 1995 the Falun Gong student shared with others that he had introduced Falun Gong to his former minister, Li. He said that he mainly spoke with Li about the ways in which Falun Gong benefited the state and the nation. He gave a copy of Falun Gong’s principal book, Zhuan Falun, to Li. Li Peng, meanwhile, was no outsider to Falun Gong either. He had read the book Zhuan Falun himself. Li obtained his copy from a vice-minister in the Ministry of the Electrical Power Industry, which Li used to head. Since Jiang Zemin lived next door to Li at Zhongnanhai, Li personally gave a copy of Zhuan Falun to Jiang. Jiang’s former supervisor at the Wuhan Thermal Power Research Institute practiced Falun Gong, as well. At one of the institute’s parties, former colleagues of Jiang spoke with him about Falun Gong. In 1996 when Jiang inspected China Central Television (CCTV), he saw that a staff member had a copy of Zhuan Falun on his desk. Jiang said to the person, “Zhuan Falun—this is a good book.” Yet in spite of these facts to the contrary, Jiang later claimed—after banning Falun Gong—that he had never heard of the practice until April 25, 1999. It was a flat-out lie. Luo Gan similarly had heard of Falun Gong early on. In 1995, in fact, Luo’s former supervisor and colleagues in the Academy of Mechanical Sciences introduced him to Falun Gong. Hu Jintao, China’s current leader, learned about Falun Gong no later than 1998. Zhang Mengye, his former classmate at Tsinghua University, had at one time suffered from cirrhosis of the liver and liver ascites. Zhang’s face turned dark and dropsical, and the hospital pronounced there was no hope of survival. But by taking up the practice of Falun Gong Zhang managed to escape from the jaws of death. When Tsinghua classmates gathered at alumni reunions in 1998 and 1999, Zhang attended both, healthy as ever, and personally shared with Hu his experience of recovery. Zhang also mailed the books of Falun Gong to Hu Jintao’s wife in hopes that the couple might in kind come to enjoy better health. Hu’s wife sent a postcard to Zhang wishing to express the couple’s gratitude. The 1999 alumni reunion happened to be on April 25—the day 10,000 followers of Falun Gong gathered in demonstration at the State Letters and Complaints Bureau near Zhongnanhai. Hu and his wife saw the dramatic scene on their way back to Zhongnanhai from the alumni party. Hu afterwards passed on word to Zhang, via a mutual classmate in Beijing, to be careful. Beginning from the year 1992 there were people who practiced Falun Gong in every ministry and commission directly below the State Council. And the number of practitioners only continued to grow. Even a number of vice-ministers took up the practice. From Chairmen and Vice-Chairmen of the National People’s Congress on down to its Ministers and Vice Premier, to Chairmen and Vice-Chairmen of the Chinese People’s Political Consultative Conference, almost everyone in power had read Zhuan Falun. The wives of all seven members of the Standing Committee of Politburo of the Central Committee of the CCP—China’s most powerful ruling body—had learned the practice of Falun Gong. Its pronounced effects on health and moral values led the qigong to spread—largely by word of mouth, no less—at an incredible speed. By 1999 more than 100 million people in mainland China had read Zhuan Falun.